This is one of the commonest Riccia species and grows in irregular rosettes up to 2 cm diameter. The thallus branches may be over 2 mm wide, are broader than long, greyish-green above, becoming brownish when old, and have a very conspicuous, sharply V-shaped median groove. The thallus sides are almost vertical, and meet the top at an acute angle. Small, colourless ventral scales along the margin are visible with a hand lens. 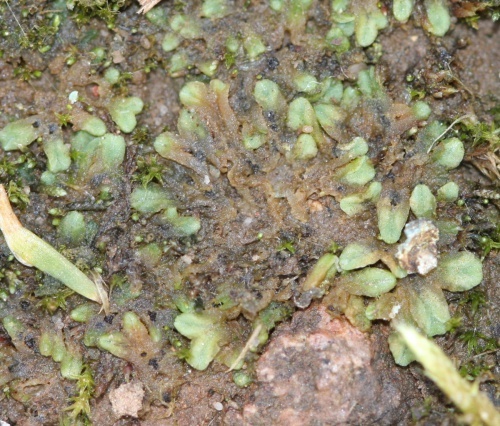 Capsules become visible in decaying, older parts of the thallus. In arable fields, gardens, on bare soil on waste ground, gravel tracks, footpaths, cliff tops, and sometimes on thin soil on rock ledges and on mud by lakes and reservoirs. It grows on both acidic and base-rich substrates. A common and widespread species in Britain.